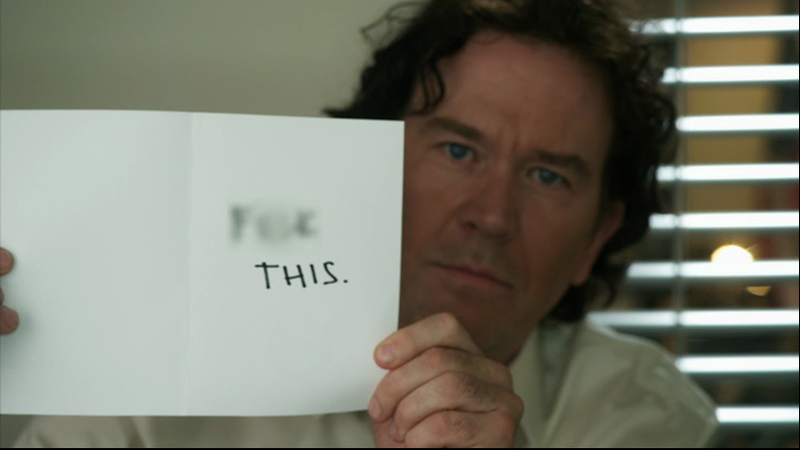 Leverage is the kind of modern show that people who don’t like modern television tend to like. It’s old-fashioned: formulaic, familiar, minimally serialized. It’s a genre show – a weekly caper, Mission: Impossible retrofitted for an era where capitalists, not communists, are the bad guys. Usually I hate contemporary TV shows that try to be like old TV shows. But Leverage is special. It’s a lot of fun. And it kept getting better as it went along – I have to switch to the past tense now, because its cancellation was announced while I noodled with this piece. The heroes of Leverage are a quintet of criminals who do the Robin Hood bit: they use their skills to avenge the little guys who have been wronged, usually by some legally untouchable corporate fatcat. It’s a show about the 47% versus the 1%, and although its politics are smart and topical, it doesn’t ram them down the viewer’s throat. The secret to Leverage is that although the plots are intricate, the show is – in a way that Mission: Impossible always resisted – totally character-driven. 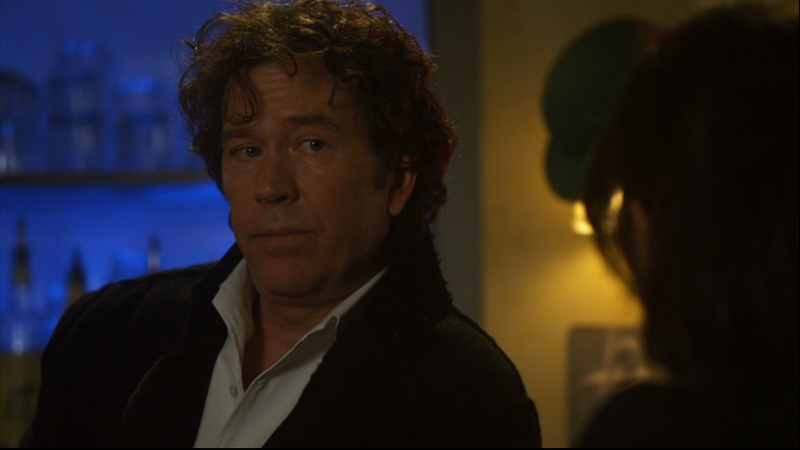 The leader of the gang, Nate Ford (Timothy Hutton), is a former insurance investigator driven toward vengeance by the death of his son at the hands of, yes, his corrupt employer. His team is composed of likable misfits, each with a useful set of skills: actress/grifter Sophie (Gina Bellman), who has an (initially) unrequited affection for Nate; computer hacker Hardison (Aldis Hodge), a fast-talking nerd; muscle man Eliot (Christian Kane), who has rage issues; and thief/pickpocket Parker (Beth Riesgraf), a blithely adorable sociopath. Although Nate remains a moody, tormented soul, Leverage is essentially light-hearted. A breezy, improvisational performance style shifts the show away from its angry center, and makes it more of a romp. The actors are all winners, complementing each other in a way that reminds me of the original C.S.I. ensemble. Their camaraderie is joyous – it’s clear that both the actors and their characters are having the time of their lives. It’s touching to see these misfits form a makeshift family, even as the actors are shrewd enough to remind us it’s a dysfunctional one. Kane, in particular, has a compact, subtly Southern, and very authentic sense of tightly contained violence, and yet it informs a funny kind of comic timing. Particularly during Eliot’s banter with Hardison, whose geekiness drives him up the wall, Kane’s short-fuse is hilarious. Riesgraf, too, never lets go of her character’s fundamental oddness. She’s like a robot learning how to be human. When good actors get the chance to build their characters from the ground up, and stay true to them over the course of a long-running show, magic happens. By the fourth season, some of the characters have coupled romantically in ways that are touching (and also plausible, unlike some of the “shipping” on C.S.I.). Nate’s functional alcoholism remains a fascinatingly unresolved issue. Just the fact that Leverage doesn’t feel the need to scold or cure him is itself impressive, but the way the other characters dance around it, how they have to find ways to deal with their concern and cover for their leader’s shortcomings without trying to fix him, adds a layer of uneasy tension. A lot of good shows wither because the writers can’t generate realistic conflicts between the main characters – famously, Gene Roddenberry’s insistence that everyone on a 23rd century starship should get along swimmingly drove the writers of Star Trek nuts. On Leverage, the five protagonists have needs and values that are varied and clearly demarcated, so conflicts arise organically. While it’s impossible not to root for the bonds between these vulnerable people to last, there’s a constant awareness that they’re all fundamentally loners, that they could fall out and go their separate ways if things really went sideways. Leverage’s episode orders approached network-size – eighteen in the fourth season – and that was probably too many. 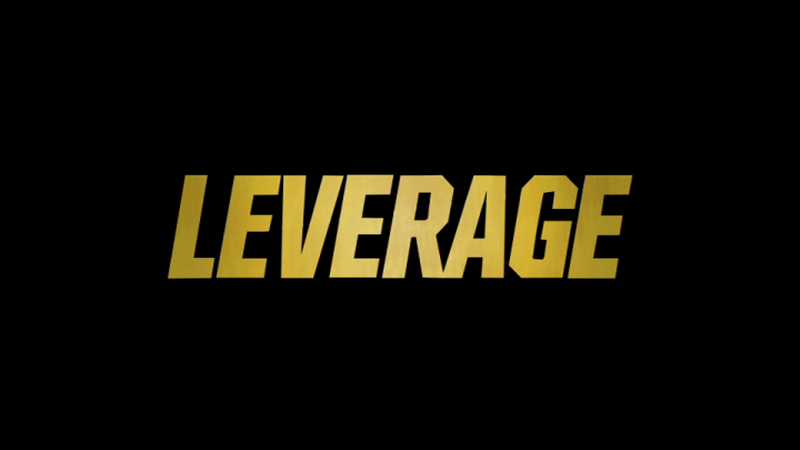 Each season had its share of filler – Leverage goes to Nashville! Leverage goes to coal country! – and there was the occasional ambitious flop. The half-century-spanning lost-loot mystery “The Van Gogh Job” fails because guest star Danny Glover is thirty years too young to play a World War II veteran. But the best episodes, particularly towards the end of the run, were crafted to fit the characters’ skills and vulnerabilities like a glove. “The Cross My Heart Job” glances off Nate’s buried grief for his son; it’s guaranteed that he’ll plunge the team into a twisty spur-of-the-moment airport heist to intercept a cooler carrying a purloined heart to a dying robber baron. “The Gold Job” explores Hardison’s resentment over being taken for granted and puts him in charge of a con for the first time; the outcome depends on whether control freak Nate will undermine or support his colleague. “The Radio Job,” a nifty locked-room con with the unlikely setting of the U.S. Patent Office, brings back Nate’s kryptonite, his low-life petty criminal father (Tom Skerritt), and again divides the team leader’s loyalties as their gambits cross purposes. The fourth-year finale goes a bit astray, indulging in a macabre climax that discards the team’s moral code too cavalierly. 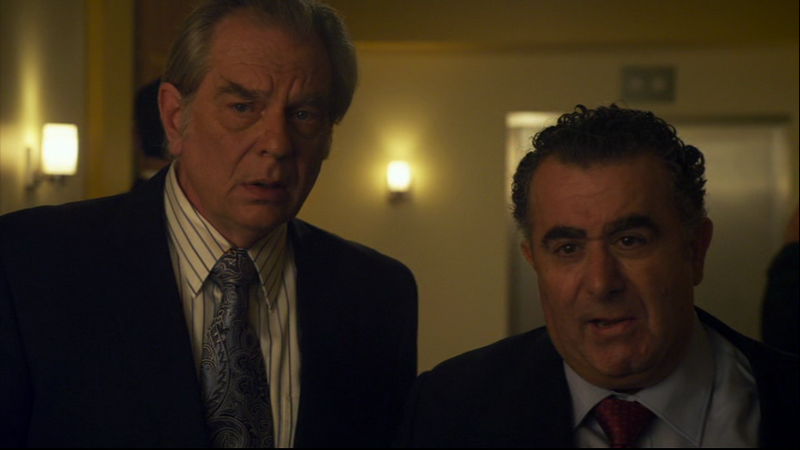 But how can you quibble with a television hour that unites the great character actors Leon Rippy and Saul Rubinek (below) in chortling villainy? Then there’s “The Office Job,” which is one of the most complex and rewarding television episodes I’ve come across during the present decade. In it, Nate and Co. infiltrate a greeting card company, the cubicle-farm headquarters of which is also being filmed by a documentary crew. “The Office Job” is a double parody, of both the comedy series The Office (a joke everyone will get) and the ouevre of the gloomy German filmmaker Werner Herzog (one for the cognoscenti, even though Herzog is a star of the art cinema world). At first the Herzog spoof seems one-note – Peter Stormare’s performance is unsubtle – but once the bombastic director is drawn in as a confederate, the show has fun with his childlike enthusiasm for the con. 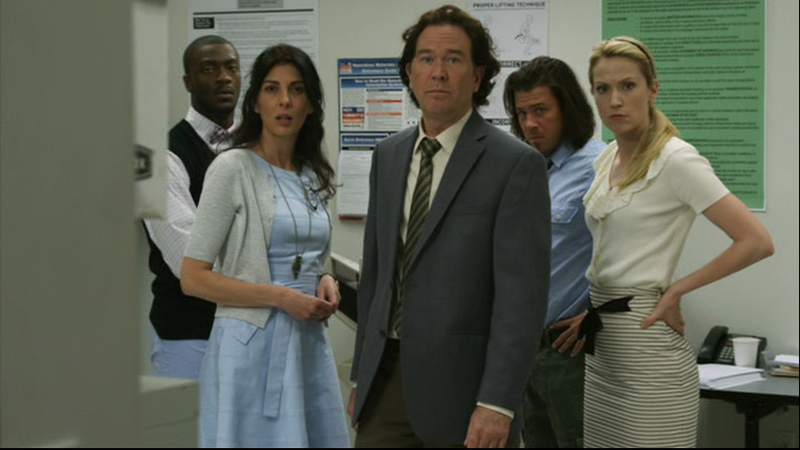 With regard to The Office, Leverage mocks not only its content but its form. Just as we, along with Nate and company, realize that Stormare’s crew is recording everything, “The Office Job” switches from the expected filmic grammar to the handheld video aesthetic of a single-camera sitcom. It’s a jarring, daring cut – one of the ballsiest edits in the history of television. Mockumentary becomes a strange and somehow newly urgent way to frame a Leverage caper. The gag pays off over and over again, as the crew suddenly has to grapple with the constant presence of a snooping cameraman while they carry out a con. 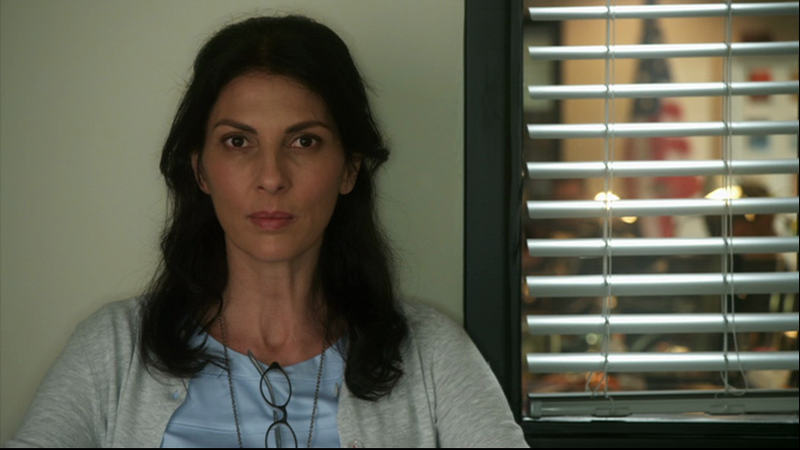 The show can make stylistic leaps like this because it has that bedrock of well-defined characters, all of whom reveal new aspects of themselves in response to the new stimuli. Parker’s inability to understand metaphor, for instance, sets up funny gags in which the others’ efforts to talk in code while on camera fail completely. The direct-address segments – in which the Leverage characters, like their counterparts on The Office, comment upon the events taking place – morph from snark into something really startling, as Nate and Sophie air some raw, nasty gripes about each other. It’s a bracing, uneasy payoff to a simmering resentment that has festered throughout the season, and a reminder of how rarely TV shows are willing to present their popular characters in a truly unfavorable light.